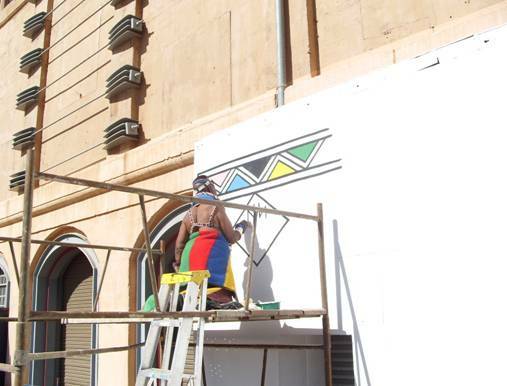 an award winning Ndebele mathematics-mural is in development in downtown Jo'burg ! Petrus Mahlangu introduces Francinah Ndemande, Sophie Mahlangu, Esther Mnguni and Esther Mahlangu to guests at the launch of the teacher's resource book and DVD Africa meets Africa: Ndebele Women designing Identity at Sci-Bono Discovery Centre in Miriam Makeba street, Newtown,Johannesburg. 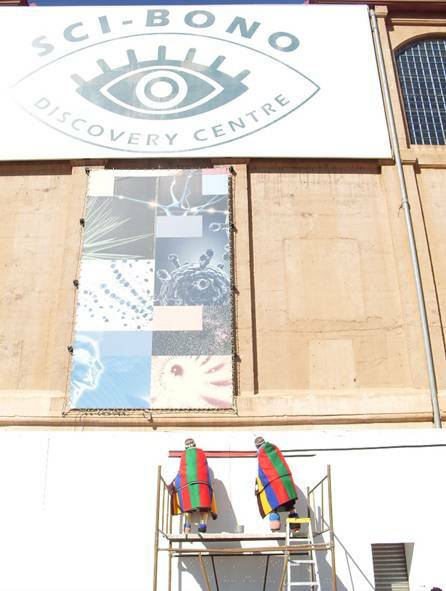 The wall painting originated by the artists at the launch is being developed into a permanent display and Mathematics teaching tool at Sci-Bono Discovery Centre. Thanks to the generous sponsorship of Plascon Paints, BASA and Natalie Knight - The Art Source, we are offering all mathematics educators a unique opportunity to discuss what the National Curriculum Statement refers to as 'indigenous knowledge systems'. 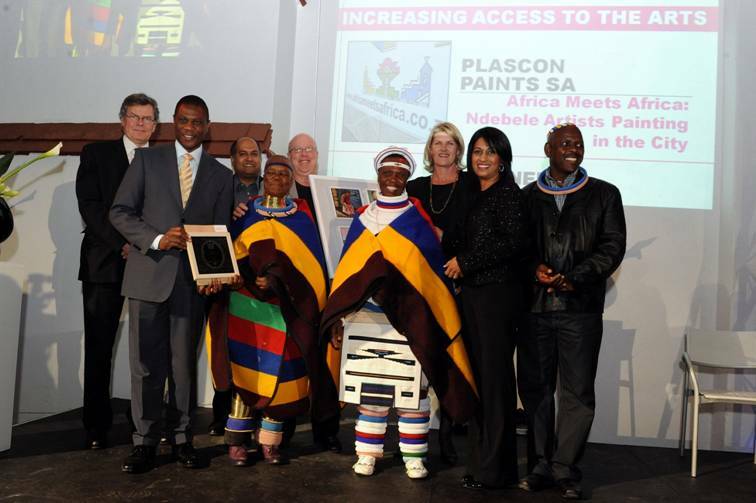 In August 2010 Business and Arts South Africa (BASA) awarded their Access to the Arts award to Plascon Paints SA for the project Africa meets Africa: Ndebele Women painting in the City. AmA mathematician Dr Chonat Getz has since developed the mathematics of the artists' mural designs and the mural continues to grow as a continually developing process. It will be completed this year. 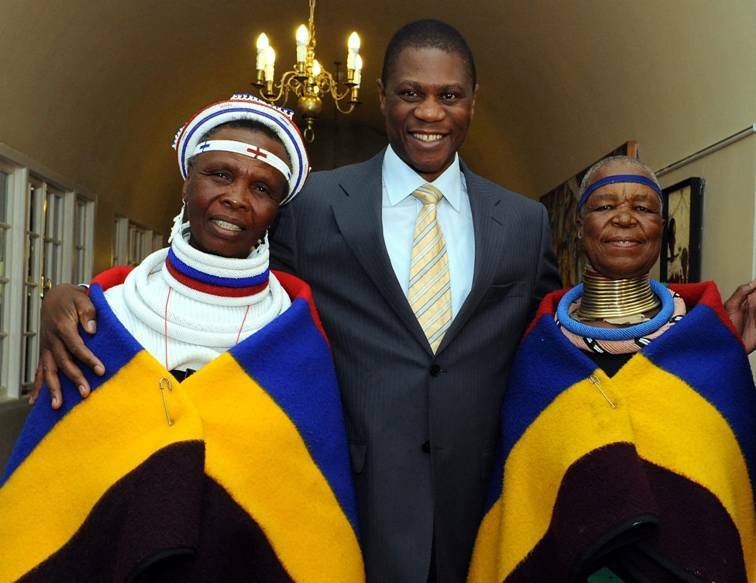 At the award ceremony Arts and Culture Minister Paul Mashatile was photographed with Esther Mahlangu(right) and Esther Mnguni (left), who represented the four artists developing the mural at Sci-Bono Discovery Centre in Newtown. The other two artists are Francien Ndemande and Betty Mtau. Behind Esther Mahlangu Patrick Seager of Plascon holds the BASA award. Helene Smuts, Director of the Africa meets Africa Project stands behind Esther Mnguni. To their far left is Petrus Mahlangu of the Nkangala District Department of Culture, Sports and Recreation, another key member of this project. Internationally famous artist Esther Mahlangu at work on the wall painting at Sci-Bono Discovery Centre n Newtown, Johannesburg. 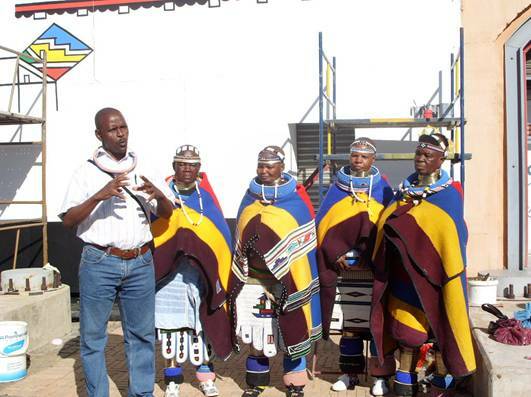 Of course, world famous Esther Mahlangu will be the first to tell you she has never looked at a Mathematics textbook. When we asked Francinah Ndemande how she manages to generate such straight lines and a complexity of perfectly symmetrical patterns by hand, she responded: "I use my eyes only!." Now compare that statement to one by Mathematician Benoît Mandelbrot in his 1982 publication The fractal geometry of nature: 'For me', he wrote, ' the most important instrument of thought is the eye.